Reduce your image processing time and improve quality control in your Raw workflow by combining the powerful color capabilities of the ColorChecker® Passport and Adobe® Imaging solutions. Quickly and easily capture accurate color, instantly enhance portraits and landscapes, and maintain color control and consistencyfrom capture to edit. Superior color results in a fraction of the time! 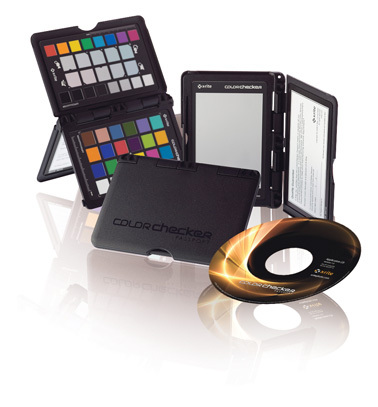 ColorChecker Passport is a powerful ‘capture to edit’ color solution for any photographer looking for more accurate, consistent color and creative flexibility. And when you combine ColorChecker Passport with Adobe® Imaging solutions you’ll gain even greater benefits. ColorChecker Passport combines three photographic targets into one pocket size protective, multi-positionable case that adjusts to any scene. Together with the included camera calibration software, you get the ultimate in functionality, flexibility and portability. There are so many ways to incorporate ColorChecker Passport into your Raw workflow. Whether you take advantage of the entire solution, or just a couple of ColorChecker Passport’s many features, you’ll realize improved quality and productivity almost immediately. Portable Protective Case – adjusts to accommodate multiple positions so you can adjust the targets to any scene. Also includes a handy lanyard. You’ll still gain many great benefits when you include ColorChecker Passport in your workflow.